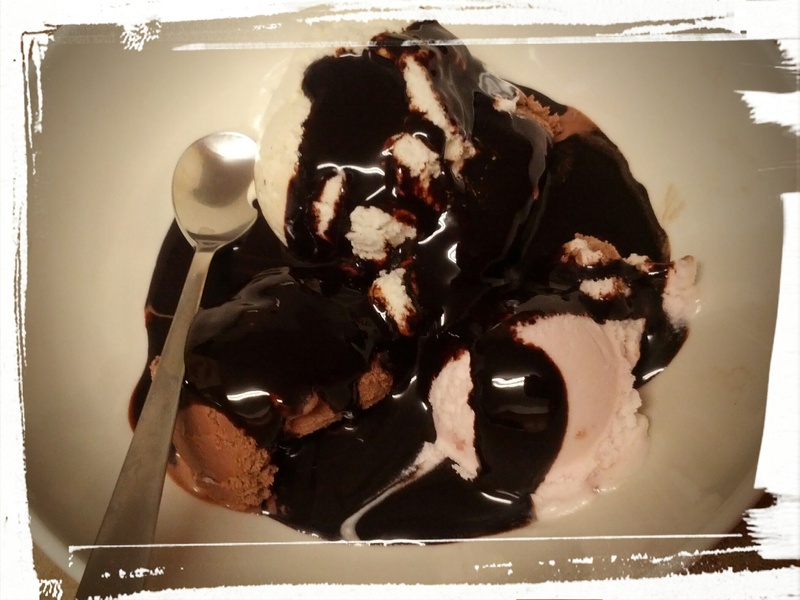 A Ton o’ Hot Fudge Sauce! 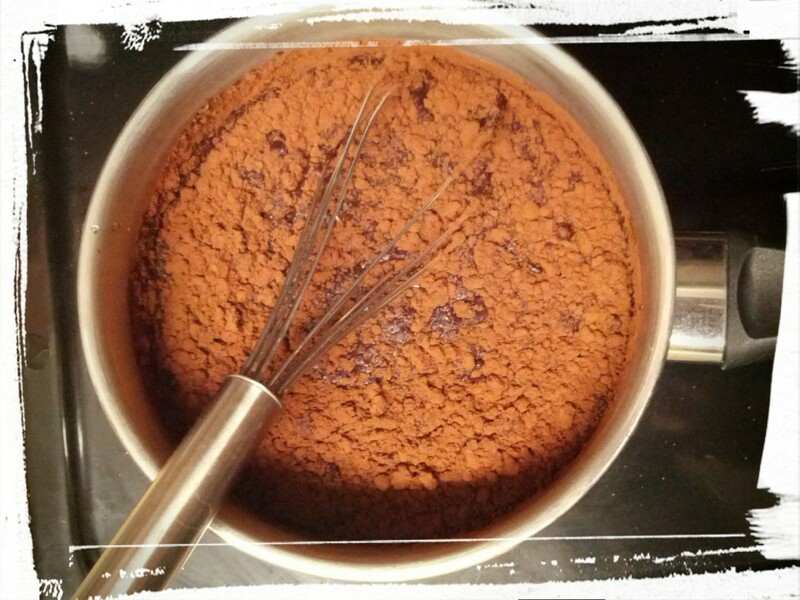 Pouring on the chocolate. Love! I love chocolate. I do. As is evidenced from this post where I write about snacking on chocolate at midnight. The DH also knows that I like chocolate. Recently, I told him that I was craving chocolate, and he came home later that night with a whole BAG of it! Every type of chocolate bar he could find, he bought, along with some fancier types of Lindt bars, and even Haagen-Daas chocolate chip chocolate ice cream! (He knows me well.) He scored major brownie (see, chocolate!) points, I have to say! This recipe makes quite a bit of sauce, so you can keep it in a jar in the fridge until you finish it up. It’s great to add to milk to make a rich chocolate milk, but don’t use more than 1 tbsp. per 2 cups of milk, or it’ll be too chocolate-y (yes, there is such a thing!) — it’s that rich and dense! I just ate some with some ice cream, and it was so chocolate-y that it made the chocolate ice cream taste like vanilla. True story. Enough with the descriptions, let’s make some sauce ! Bring all ingredients to boil in a saucepan, and then simmer for 5 minutes, stirring constantly. That’s it, you’re done! 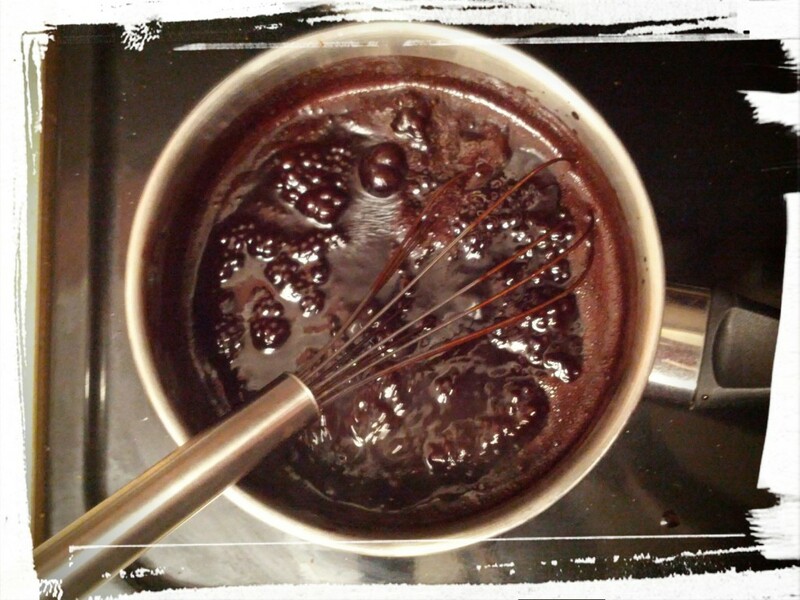 Bubbling chocolate…be still my heart! After serving 7 servings of this, I still have a standard canning jar of syrup left. And since the DH doesn’t like chocolate, it’s mine, all mine! Bwahahaha! *composes self* *smiles angelically* And now to have a glass of chocolate milk before bed! Next Post: Caramel Corn and Fundraising with Baked Goods. This entry was posted in Desserts Not Otherwise Categorized on October 23, 2014 by Margaret. It’s soooo unbelievably easy — get your kids to help make it. One to measure, one to stir, and then you can eat it all! Bwahahah! Ahem. OMG..super easy to make!! And taste oh-so chocolatey. I mixed a few spoonfuls into a glass of cold milk and it was pure heaven! So much better than those fancy overpriced chocolate milk out there. My hubby was thrilled. 5 stars! !